This is a 32 ounce bottle of ProTek R/C "TruClean" RC Car Degreaser. ProTek R/C understands that how your ride looks is as important as how well it performs. We all want to shine, but a clean car is not all about showing off; dirt and grime can slow a car down, kill bearings and lower overall performance. Sometimes running at your peak can just be a wash away. The ProTek R/C TruClean Degreaser is an environmentally friendly multi-purpose degreaser that can be used on any and all surfaces without harm. It can be used to clean and degrease plastic, rubber, metals, vinyl, textiles, machinery or just about anything you can spray it on. It does not contain any citrus, petroleum distillate or glycol degreasers that can potentially harm certain surfaces over prolonged periods. It is biodegradable, non-toxic, non-corrosive and non-flammable. TruClean is safe on all surfaces, o-rings, rubber seals and plastic parts. Spray TruClean onto your part or surface to be cleaned. Or, soak part in container with TruClean. Allow TruClean to penetrate for 2 to 5 minutes. Rinse completely with water and or remove excess with clean towel. 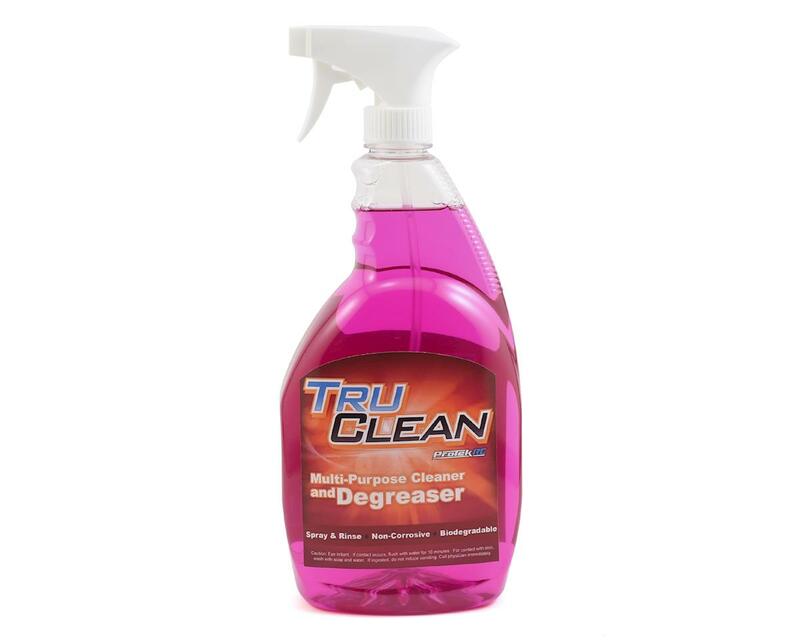 It’s a degreaser, y’all. Use it to clean oils, greases, and other petroleum based fluids and lubricants. This is not a car wash spray - Protek makes a spray specidically for that, just search for TruClean Wash. I use this stuff when building and maintaining shocks, diffs, universals, and bearings. Awesome also for household greases; I even cleaned my bbq area and it dissolved all of the — wait for it — GREASE in the area. Great product. Great stuff! I'm almost through half a bottle and am very impressed at how well it cuts into grease and dry clay and yet be gentle enough to not wear gloves. Works very well cleaning tires (even very soft compounds,) Just spray on, wait a few seconds, scrub, then rinse! This stuff is exactly what it says it is DEGREASER, I made the mistake of spraying my entire nitro buggy down after the race day and air compressing it and it left the plastics in a ash type of color, I should have used the Protek Tru Wash, but besides that being my only complain its super strong at fighting oil and grim, sprayed down my fuel tank, shocks, air filter system and everything I needed deep cleaned and rinsed with water and it came right off, works very well..but if you plan on using this to clean your entire car and air compress it off definitely pick up the Tru Wash or use simple green or something along those lines. Will buy again for sure.